In a sector where brands are always looking at new ways of catching the eye of the consumer, the design of shops, department stores and retail developments can play a huge role in increasing both footfall and sales. 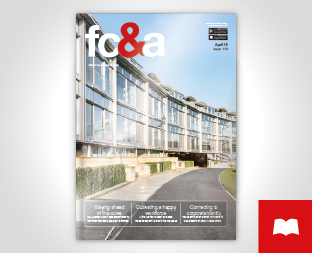 Chris Murray, Contractor Developer Manager with leading fenestration designer and manufacturer Senior Architectural Systems, takes stock of what specifiers should consider when picking out the perfect glazing package. ith companies needing to showcase their wares in the most literal sense, the use of glazing is a core design feature of retail buildings. However, delivering fenestration packages that meet the sector’s complex performance characteristics but still allow individual retailers to create a strong brand identity demands careful consideration. Although the retail sector features many different building types, glazed facades are commonplace, and the popular ‘shopping list’ of fenestration products comprises shopfront glazing, curtain walling and commercial door systems. For projects that only require ground floor or low-rise glazing, shopfront systems offer the ideal solution to creating an inviting shop floor that has the required level of visibility. As shopfront glazing systems are usually only appropriate for single-storey applications, it is a popular choice for smaller retail units or for refurbishment projects where the overall look of existing facade materials must be been retained. Curtain walling systems come in where shopfront glazing stops, as they can be used for high-rise developments and for projects that require glazing to span multiple floors. Commercial door systems are another key requirement for this sector, with swing and automatic opening systems being the most popular. Low thresholds that provide ease of access and anti-finger trap stiles, although not a legal requirement, are an important consideration in ensuring safety standards are met. The robust nature of aluminium door systems which means they require little or no maintenance, again, make them a tried and trusted product choice for the retail sector. From a design perspective, the benefits of specifying aluminium fenestration systems are vast. Firstly, the inherent strength of the material allows much larger and taller glass panels to be safely accommodated within attractive slim frames. The quality of today’s aluminium curtain walling, door and window systems also provides specifiers with an aesthetically-pleasing solution that offers full compliance with the relevant performance requirements such as energy efficiency, security and weather-resistance. Aluminium fenestration systems can also be powder coated in virtually any colour. This design flexibility is an essential way for larger retailers to reinforce brand identity but is also an effective way of creating a bespoke and individual look for the smaller more independent stores. The retail sector features a range of different building designs which all require a different approach to the specification of fenestration systems. A large out-of-town retail complex, for example, often features a greater use of glazing in order to create an eye-catching facade that is easily visible from the approaching road networks. Similarly, shops located within a busy high street will face unique design requirements depending on the neighbouring architecture and individual town planners. However, creating the perfect shop window requires more than just meeting specific aesthetic challenges as a building that performs poorly in terms of maintenance and operational efficiency can make a serious dent in any profit margin. It is vital that retail premises create light and airy interior spaces that not only showcase the products effectively but are also pleasant environments for both customers and staff. As such, this market is particularly reliant on the use of artificial light and air conditioning, but this can have a negative effect on running costs and carbon emissions. Specifying windows, doors and curtain walling systems that offer improved thermal performance and can achieve compliance with Part L of the Building Regulations is, therefore, essential. Aluminium glazing systems have evolved to offer improved thermal efficiency, and by specifying doors, windows and curtain walling systems that can achieve U-values that are far lower than stipulated in the current Building Regulations, major improvements can be made to the overall carbon footprint. There is also the opportunity to offset high carbon emissions in mechanically cooled areas and make potential costs savings by removing the need to specify more expensive sustainable solutions such as photovoltaic roof panels. One consequence of the rise in online shopping is that more retailers are investing in out-of-town distribution centres and although they are subject to a different design code to traditional retail outlets, the need to create an energy-efficient building envelope is still a key factor. Although new-build projects may offer some flexibility in that they can be orientated to minimise solar gain, there is often still a requirement to combine high-performance glazing systems with shading and ventilation. It is, therefore, vital that careful consideration is given to how these individual elements of the glazing package can work together, as well as looking at the coordination between other interfaces that comprise the total building envelope, particularly in terms of how the fenestration systems work alongside the cladding or external facade material. Here, early and close collaboration with the systems manufacturer and specialist installers can prove extremely beneficial in ensuring that the specification of the glazing package is both appropriate and cost-effective for the client. Indeed, specifying products from manufacturers that can supply the full suite of products and that have an established and experienced network of fabricators and installers can bring numerous cost and time savings to a project. The use of BIM can also help by flagging up potential risks and, more importantly, provide the perfect forum in which cost-effective and practical solutions can be identified. As the nature of retail buildings must adapt to become more sustainable, aluminium fenestration systems can provide excellent value for money in a sector that is facing major changes in terms of how and where people shop. Flat-roof skylights: are specifiers walking on precarious glass?